VeloRoutes France - find all the "easy pedalling" routes & greeways in France. ferrocarta.net - comprehensive maps of the French railway network. voyages-sncf.com - The French Rail (SNCF) system is generally bike-friendly but not all high-speed trains (TGVs) accept bikes. Find out more via the SNCF website, clicking the details icon for suitable trains - a picture of a bicycle means the train takes bicycles. 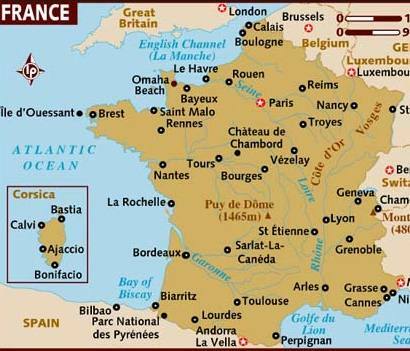 About France - includes a cycling themed section with general information, maps & guides. France Velo Tourism - French government comprehensive site dedicated to cycling in France.